The click-kill-loot formula has a long tail on video games, whether originating in the classic Diablo franchise, the later console Baldur's Gate titles from Interplay or THQ's Titan Quest, there is something addicting about trolling through dungeons killing foul beasts to get cool gear. While the hack & loot gameplay style is not unfamiliar to console gamers, Microsoft added a nice treat to its House Party lineup this year with a translation of last year's breakout indy hit – Torchlight. 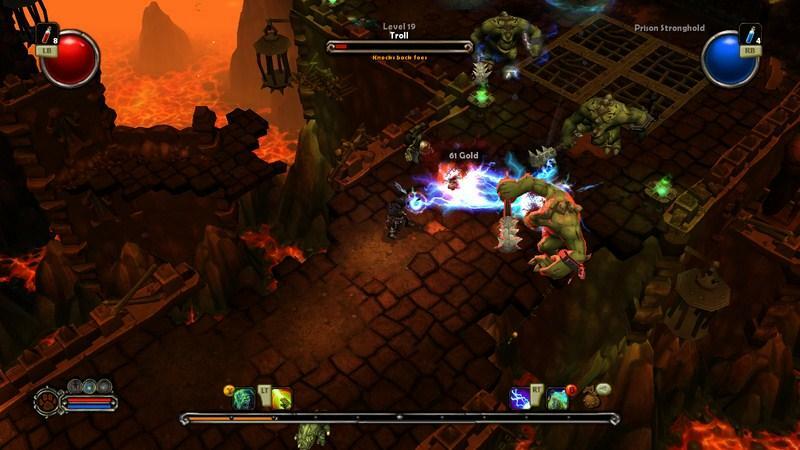 Torchlight is a spiritual sequel to the simple Diablo formula created by many of the folks who created Diablo for Blizzard. It features a single character with a pet/pack mule delving deeply into a fairly generic fantasy dungeon set under a besieged town. Instead of demonic otherworldly invasion however, the threat comes from magic crystals called ember that contain vast power and seemingly corrupt those exposed to its emanations. 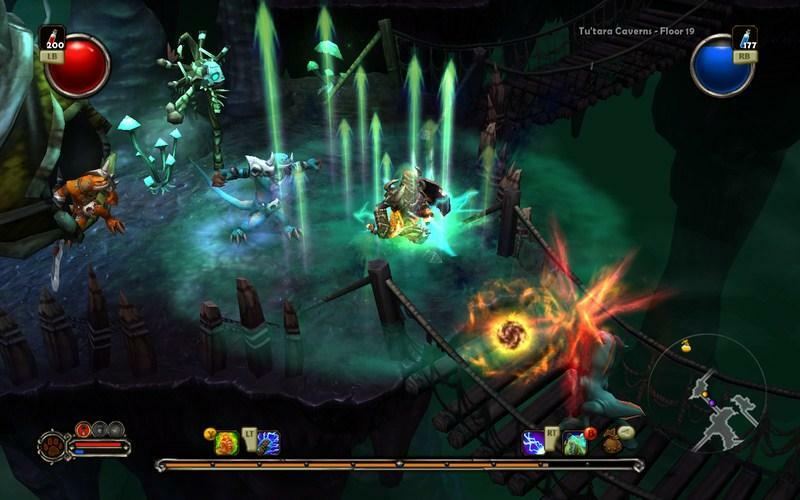 The graphics favor a cartoony style, favoring bright colors and exaggerated figures to realism and gore. This makes Torchlight feel all that much more family friendly, despite the violence you perpetrate on the masses of humanoids and creatures tainted by the ember below the hub town. Along with these style choices, Torchlight also manages to give off an air of "steampunk" influence thanks to the art design, which is handy for a game that is really very story-light. There is a tale to be told here, but Runic avoided lengthy cut-scenes and deep plots in favor of voiced dialog in small clips with shoestring continuity. Maybe it was an admission that people who play these sorts of games are not looking for Mass Effect-like revelatory schemes or great personal investment in character development outside the skill and statistic bumps that allow them to use better armor and weapons. Torchlight is in many ways a better re-playable game because of its lack of focus on narrative. 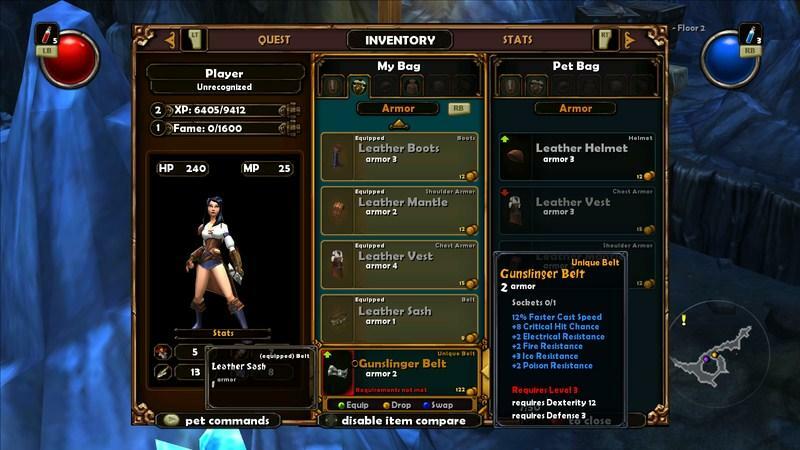 Being a port of the PC to the Xbox 360 controller, Torchlight's interface and menu systems are necessarily simplified. Gone is the task bar-like spell control, the tabbed skill-tree and slotted inventory system. 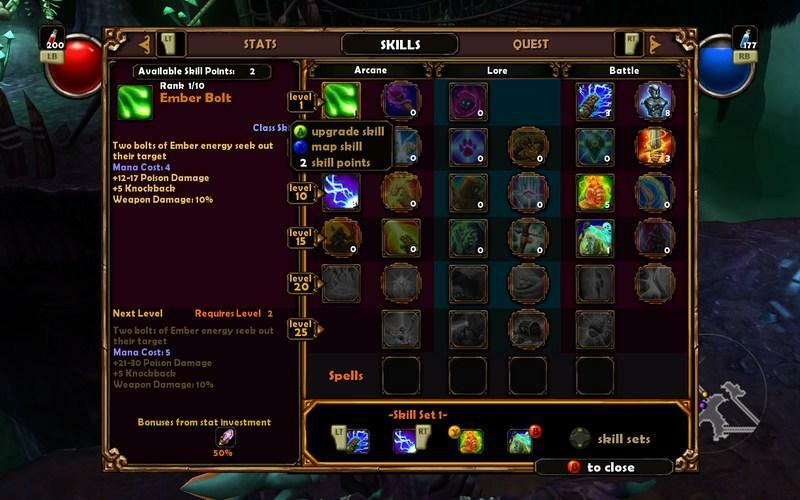 Instead this version of Torchlight maps six abilities to the controller buttons, uses a list for inventory management and overall feels a bit less effective than its PC counterpart. It's unfortunate that a game that is really all about inventory management has a system that just doesn't quite flow well. Moving objects between the character a merchant or pet can get frustrating and mapping new abilities to the limited button switches feels less than optimized. Combat however is pretty easy to master. Regular attacks using hand weapons map to the “x” button, spells and special abilities to the others. Another translation thing that impacts Torchlight is the lack of control precision. Mouse oriented click-kill interfaces offer precision the analog stick just can't match. Players need to consider positioning when executing attacks as the game's auto-targeting doesn't help as much as it should. Mobs of enemies can quickly surround you and the need to swivel and spin to get the right angle is a little frustrating. 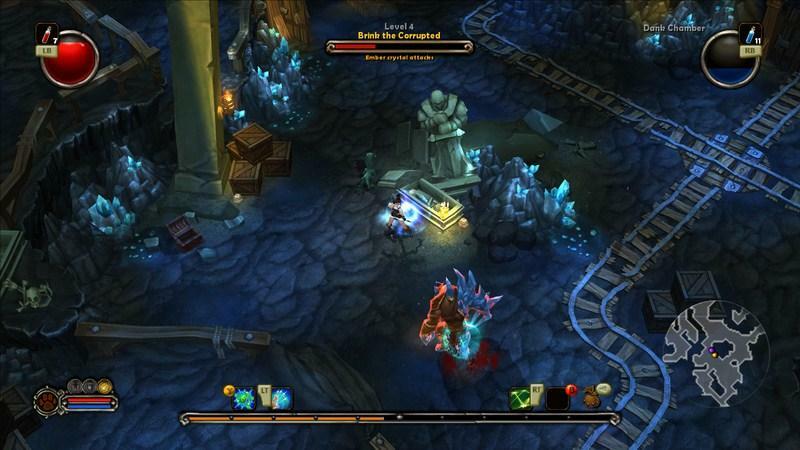 Unfortunately, what keeps Torchlight from breaking out of the mold is the lack of multiplayer features. While the PC version was also not able to support a party of players, this 360 port feels very lonely without friends. 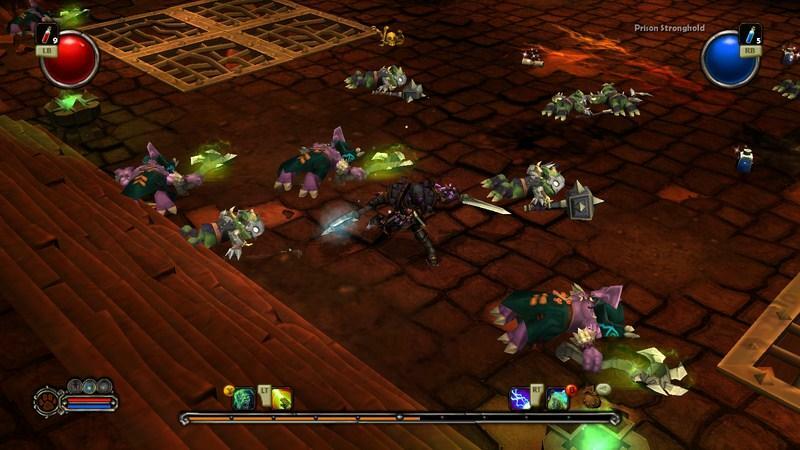 Torchlight II is in the works for the PC and promises party play, so who knows if it'll see a translation to the 360 with those desired features included. Overall, Torchlight 360 is great if simple fun, especially for folks looking for a bit of Baldur's Gate or Diablo nostalgia on the 360. The reasonable price on Xbox Live! makes it a recommended purchase that might not hold long-term interest, but offers random replayability and lots of loot for treasure hunters.